Knit Addictions: Doncha love chaos? Great to hear from you again Shar! Like the site. 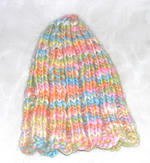 Like the pink, yellow, blue etc yarn and hat. Like it all! Good luck in Japan! I never would've pictured you as a Mary Kay rep!!! Then again, I shocked myself and became an Avon rep last year. Are you working toward the pink Cadillac? That Naturwool is gorgeous--gotta try some one of these days. Best wishes to the parents...Take care and have a great time in Japan! woah, i dont know how i found this site, i kind of just stumbled into it, lol, anyways i saw you on Vh1 and u guys rocked! i play guitar too and hopefully in the next year I'll get my own band together. I still havent gotten to listen to your band Bubble but i bet you guys are awesome. Oh yea, that fringed scarf is SO cool! ps: good luck in japan! Yes, I adore the Artiste Scarf. Details please, what yarn, what needle, anything. It's very cool. 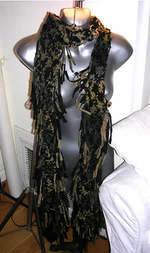 what yarn and pattern did you use to make that scarf...I love it!